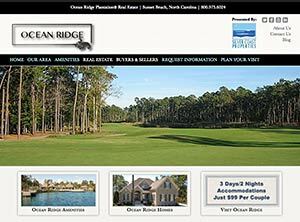 Silver Coast Properties is please to announce the launch of their new Ocean Ridge Plantation® real estate website, Southeastern North Carolina premier golf and beach community. Located in Sunset Beach, North Carolina and ideally situated between historic Wilmington, North Carolina and exciting Myrtle Beach, North Carolina, Ocean Ridge Plantation offers community residents easy convenient to air transportation, shopping, healthcare and entertainment without the inconveniences associated with larger cities. Ocean Ridge Plantation® offers residents a host of resort-like amenities within their private gates, including 72 holes of award winning golf, oceanfront beach club, indoor pool, outdoor pool, state-of-the-art fitness room, wet and dry sauna, parks, miles of walking and biking trails and much more. The new full feature website offers visitors the ability to explore the community highlights, search for available real estate, request community information and secure a specially priced accommodations. To learn more about Ocean Ridge Plantation® please visit www.oceanridgenc.com. Silver Coast Properties is a leading real estate and new community brokerage, providing professional real estate services to Southeastern North Carolina and Northeastern South Carolina.